MMM, okra! One of my very favorite veggies (not quite as beloved as eggplant). I like it in almost every form, but I especially love it fried (is it any surprise??). The important thing is to not let it get slimy, and there are a couple tricks to accomplish that. First, wash and completely dry them. If there is any moisture while cutting it releases the mucousy stuff. Then use a dry knife and wipe the knife every so often. Do not salt it until nearly cooked or after frying. 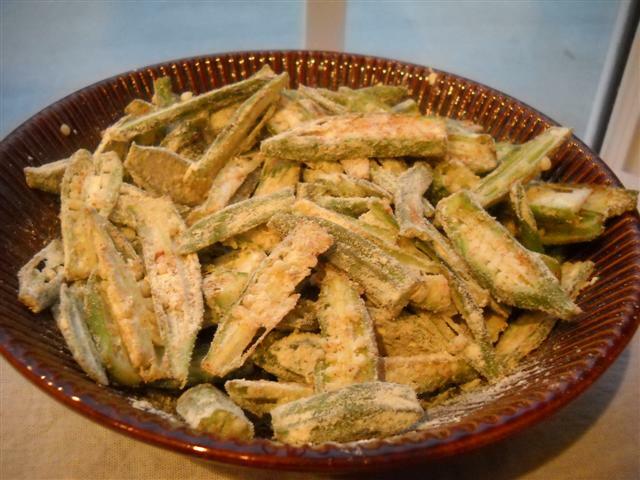 Slice the okra lengthwise into thin strips. In a bowl, mix besan flour with 1 TBS or so of rice flour, red chili powder to taste, pinch of turmeric powder, pinch of chaat masala or garam masala. Cover the okra pieces with the mixture. 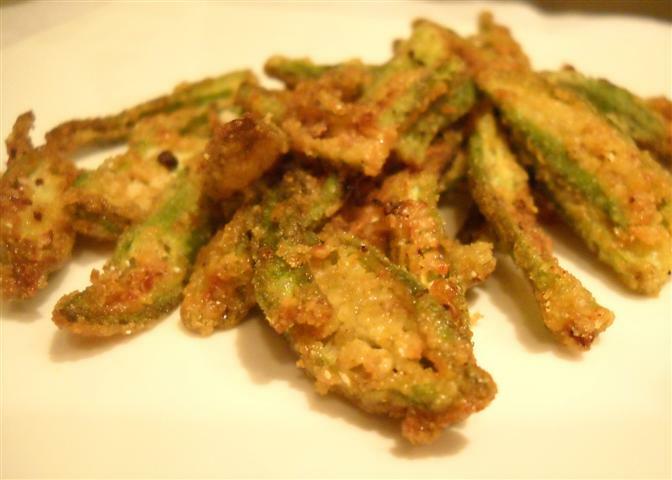 I havent given quantities because it depends on how much okra you are using. Add just enough besan flour to coat the pieces, not too much. And do not add any water or liquid! You can shallow fry if you have a very large pan to accommodate all the slices without crowding, or do it in batches. Or you can deep fry them. Sprinkle salt as soon as you remove them from the oil. You can also squeeze lemon over it, and serve immediately.